The STCC Laragh Classic was a sell out two days before the actual event but there was never going to be a full complement of riders entering the race due to the deteriorating weather that many riders woke up to on Sunday morning. It had everything a true Classic required, a course that demanded respect and aggressive riding, weather that was changing by the minute and a field of riders that had no hiding place where only the strongest and bravest would take the spoils. for about half a lap. prevent them increasing their time gap.The breakaway gap went out to just under 2 minutes for over a lap and was only brought back to under a minute with 10kms to go. In the closing 15km De Leaster was unable to add anything to the breakaway and tried to hang on for fourth position but he was unable to do so and was eventually over taken by 2 riders, Liam Rowsome from Orwell DTC (finishing 4th) and De Leasters team mate, Paul Smith, who crossed the line shouting encouragement back to the junior rider who had given his all. Craig Arrigan, South Dublin CC who worked hard with Fintan Ryan, Nicholas Roche Performance Team, and Colin Bolger, South Dublin CC, for the duration of the break was feeling the effort over the last few kms and couldn’t contest the sprint. Bolger and Ryan fought it out for the win with Ryan’s renowned finishing kick, that won him the Junior champs, taking him over the line first and the proud recipient of the inaugural STCC Laragh polished wicklow granite trophy. Rounding out the top 8 were Kenny Wilson, Audi/East Antrim CC in 7th and Donal Daly Garda cycling club in 8th bringing home a small group. 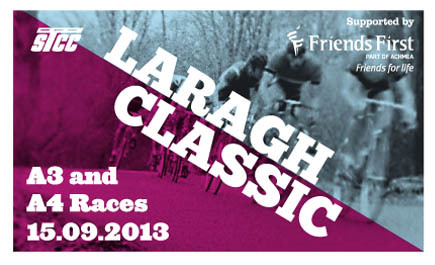 No Replies to "Laragh Classic A3 race report supported by Friends First"